MSV: UNCOVERED! Beth, Ricky Mason and Ines Garcia Keim in hundreds of campaign violations, facing up to $2.6 million in fines! UNCOVERED! Beth, Ricky Mason and Ines Garcia Keim in hundreds of campaign violations, facing up to $2.6 million in fines! Beth Mason campaign violations number almost 400!! Yesterday's breaking story on Beth Mason's campaign violation turns out to be only the tip of the iceberg. Media reports initially limited the Mason family mess to the 2011 Beth Mason for council campaign but as it turns out more violations come from the 2009 Beth Mason for Mayor campaign. Among those featured in the violations are Beth Mason's husband, Richard Mason of Wachtell, Lipton, Rosen & Katz and long time Masonista political operative Ines Garcia Keim, both listed as Treasurers. The chart below shows the full number of violations from Beth Mason's two campaigns: 2009 and 2011 tabulated from NJ ELEC. Most of the violations stem from lack of timely reporting in the campaign, re: TRANSPARENCY. Others with massive transactions in loans made to fund Beth Mason campaigns. Campaigns have a responsibility TO THE PUBLIC, and to others in the campaign process to report accurately and legally on how finances are run in their respective campaigns. The chart shows the election, counts, issues and number of transactions (violations). Questions had earlier been raised on MSV and elsewhere about Beth Mason's illicit distribution of cash to multiple people in her 2009 campaign from a single check, an obvious campaign violation. Mason made excuses for the obvious shady practice and pointed the fingers at others. But with the Mason family's huge outlays for campaign and political operatives, people are asking why any violations should occur in the first place? MSV has questioned Beth Mason more than once in City Council meetings on numerous unanswered questions on her campaign expenditures and other local media failed to follow up on any of it. Numerous political operatives, advertising and other campaign expenses have never been accounted for and Mason's shell company, Newton, Lao, Leonard & Locke continues to be a focus of interest in additional civil and/or criminal wrongdoing. 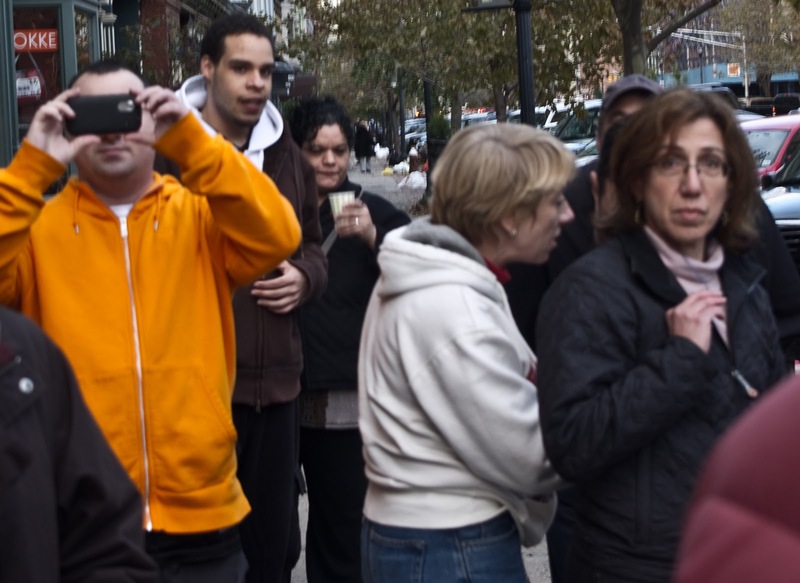 Beth Mason attempts to cower behind Ines Garcia Keim on a return photo after assaults on MSV on Washington Street in broad daylight with her political operative James Barracato (l) during the Hurricane Sandy emergency. Beth Mason stood by during the physical assault and refused the requests her henchmen cease and desist. Now she's up for hundreds of campaign violations. Talking Ed Note: It remains to be seen if the violations will be cured in the complaint. In the end, it's possible the Mason violations will be bundled into one fixed flat rate low fine. The totals in potential fines represents the maximum penalty of $6,800 each for 387 violations.